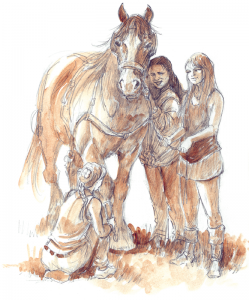 Alan Langford, in his book, WELGORA, writes about growing up in the New Forest, where his fascination for horses and the Romani people started when he lived with his family in a caravan at Drapers Copse, Dibden. 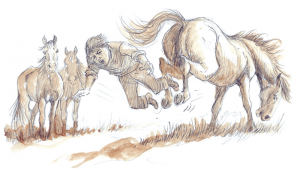 An early lesson – one of Alan’s first encounters with New Forest ponies. Alan’s instinct to draw and paint began with childhood attempts to copy a horse’s head from the comic, The Robin, then developed when as a young man working at Peko Mines, Australia, he decorated the walls of his fellow workmates’ huts with paintings of Amazonian beauties. Returning to England, Alan found a manual day job and studied art and painting at night school. He then took the big leap to work full time as an illustrator for a company that made illustrated, copper-faced plaques. 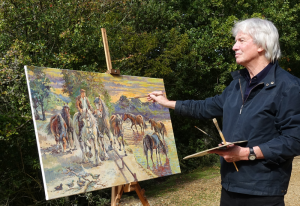 When the market changed he found himself redundant, but it gave the time to go out and paint en plein air, capturing on canvas the New Forest ponies in their own landscape. In time he found freelance illustration work, drawing for of the Puffin Fighting Fantasy books, and on the long-running comic series, The Eagle and 2000 AD. The demise of the comic pushed Alan to concentrate on his oil paintings, particularly painting the working horse. 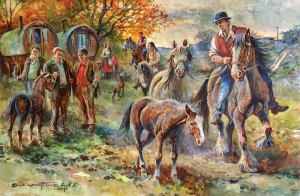 Today he continues, a full time artist and member of the Society of Equestrian Artists. 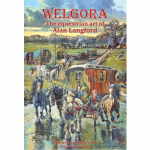 Alan’s book, WELGORA – the equestrian art of Alan Langford, is illustrated with more than a hundred sketches, watercolours and large oils on canvas.